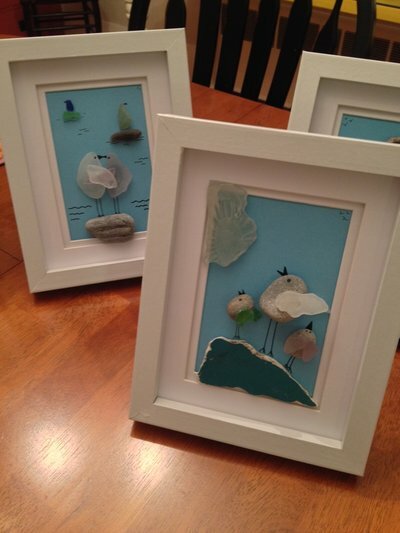 Original, framed, whimsical, , sea glass art, using only authentic Maine sea glass, created by artist Laura O'Leary. I use a combination of sea glass, pebbles, drift wood, and other items that I have found on the beaches of Maine. Many of my designs feature birds made from sea glass. Birds on a bicycle, birds enjoying the beach, birds on a clothes line, birds kayaking, birds ballooning, birds mtn climbing,! I also take custom orders that depict birds participating in an activity that the person who will enjoy the art can relate to! Example: I have created the table numbers for a wedding where the birds in each frame were featured doing things that the couple to married like to do, along withthe table number featured at the bottom of the frame. Families also order with a bird to represent each family member!. Flowers in bloom are also one of my favorite designs. Please check out my FB page to see examples of designs, to find a list of 2016 craft fairs I will attend, or visit FLIP gift shop on the Milford NH oval.